Cardio Debate > Cardio Notes > Social > “Physician Burnout” – A New Epidemic? 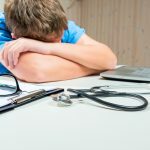 “Physician Burnout” – A New Epidemic? Burned out physicians are likely to retire early and, in the UK and the US, there is currently a trend among physicians toward early retirement. This can have a serious impact on both the size and the morale of the medical workforce and may also send negative vibrations to younger generations potentially willing to embrace a career in Medicine. The incessantly growing bureaucracy, an ever increasing number of patients attending A&E and outpatient clinics as well as the need to extend working hours to cope with this increasing demand, necessarily impairs physicians’ quality of life and reduces work satisfaction. There is relatively little support nowadays for doctors who feel burned out and this magnifies the problem. Experts in the field have proposed potentially useful measures that may in their view reduce the proportion of physicians feeling burned out. The important issue, however, is that these measures need to be assessed objectively and if deemed useful put in place without delay, making them accessible to as many people as possible. Failing to do so would have catastrophic consequences for the medical workforce, the health systems and, ultimately and of utmost importance, for patients. This is an epidemic that needs to be tackled urgently and efficiently. Shanafelt TD, Hasan O, Dyrbye LN, et al. Changes in burnout and satisfaction with work-life balance in physicians with the general US working population between 2011 and 2014. Mayo Clin Proc. 2015;90:1600-1613. Center C, Davis M, Detre T, et al. Confronting depression and suicide in physicians: a consensus statement. JAMA. 2003 Jun 18. 289(23):3161-6. Hawton K, Malmberg A, Simkin S. Suicide in doctors. A psychological autopsy study. J Psychosom Res. 2004 Jul. 57(1):1-4. Petersen MR, Burnett CA. The suicide mortality of working physicians and dentists. Occup Med (Lond). 2008 Jan. 58(1):25-9. Frank E, Dingle AD. Self-reported depression and suicide attempts among U.S. women physicians. Am J Psychiatry. 1999 Dec. 156(12):1887-94. Schernhammer ES, Colditz GA. Suicide rates among physicians: a quantitative and gender assessment (meta-analysis). Am J Psychiatry. 2004 Dec. 161(12):2295-302. Austin AE, van den Heuvel C, Byard RW. Physician suicide. J Forensic Sci. 2013 Jan. 58 Suppl 1:S91-3. Schwenk TL, Gorenflo DW, Leja LM. A survey on the impact of being depressed on the professional status and mental health care of physicians. J Clin Psychiatry. 2008 Apr. 69(4):617-20. Doctors, the traditional ‘Healers of Society’ are experiencing alarming levels of burnout. Burnout is a stress related disorder characterized by emotional exhaustion, low personal accomplishment, and depersonalization. Over the last several years, there have been major and rapid transformations in the practice of medicine due to increasing workload and patient expectations, isolation within the workplace, and loss of autonomy. This is compounded by the ever increasing focus on financial priorities which has led to competition, rather than collaboration, amongst colleagues. The collective impact is the erosion of the core values of a profession centered on service and compassion. Few large scale initiatives to decrease burnout are being undertaken, due in part to the epidemic proportion of the problem. Prevention and management strategies have to address the physical, mental and spiritual wellbeing of doctors. Prevention efforts should target medical students and junior doctors by increasing awareness and providing tools for developing resilience. Employers must accept responsibility for their contribution to this issue. In this regard tangible efforts to show genuine concern and compassion for the employees’ wellbeing and promoting autonomy will go a long way in restoring meaning and purpose in a physician’s work life. One could argue that physician burnout is an important reason for reform of the healthcare system. Greater emphasis on the importance of compassion and human values in the workplace is required, both for the sake of patients and physicians. “Burnout” in the medical community - usually the result of stressful working conditions - is far more common than we usually care to admit. To fully understand the problem, we have to be aware of the importance of “stress” in this context. Stress is a biological reaction to adversity, whether physical or emotional. Stress may have an impact on several organs and systems and can trigger a number of responses including metabolic disorders (diabetes, hyper or hypothyroidism), skin disorders such as eczema, pruritus, urticaria, and psoriasis, respiratory conditions (asthma, hay fever, tuberculosis), cardiovascular disease (coronary artery disease, hypertension, heart failure), gastrointestinal conditions (constipation, diarrhea, obesity, ulcerative colitis, anorexia) and others. Stress is a natural reaction to adversity and as such may help improving performance. However, high and/or sustained stress can lead to depression, burnout and even suicide. Why doctors tend to depress and burnout? There are several reasons i.e. reluctance to recognize symptoms of depression and/or to seek help as this may be a sign of weakness or being unfit to practice. Moreover, lack of sympathy and support from colleagues and supervisors can also contribute to depression and burnout. On many occasions, the first signs of depression and burnout are physical thus making depression and burnout harder to diagnosis. Marital problems, litigation issues and a stressful and unsupportive working environment are common precipitants of depression which may in turn accelerate burnout. Can we prevent burnout in doctors? It is important for doctors to understand that they are at a high risk of burnout, and physicians are not immune to it. Studies have shown that a normal and balanced lifestyle may be the best antidote for burnout. Younger doctors are often very vulnerable to depression and burnout and supervisors need to be aware of the negative impact that lack of appropriate support, work overload and bullying practices may have on their psychological wellbeing. Supervisors should always question themselves if they are being reasonable in their dealings with people under their supervision. Burnout is a common problem in modern societies in general and medical institutions in particular. Stimulating cooperation instead of unhealthy competition in the medical community and helping medical students becoming “balanced” human beings, rather than just “high-achievers”, should be an institutional goal. Physicians in general, and junior doctors in particular, should have enough time to rest and develop a fulfilling personal life. When our colleagues need help, it can make a difference knowing that we are there for them.